Richard Frederick Heck (August 15, 1931 – October 10, 2015) was an American chemist noted for the discovery and development of the Heck reaction, which uses palladium to catalyze organic chemical reactions that couple aryl halides with alkenes. The analgesic naproxen is an example of a compound that is prepared industrially using the Heck reaction. For his work in palladium-catalyzed coupling reactions and organic synthesis, Heck was awarded the 2010 Nobel Prize in Chemistry, shared with the Japanese chemists Ei-ichi Negishi and Akira Suzuki. Heck was born in Springfield, Massachusetts in 1931. He earned his Ph.D. in physical organic chemistry in 1954 at the University of California, Los Angeles (UCLA), working under the supervision of Dr. Saul Winstein. After two periods of postdoctoral research at the ETH in Zurich, Switzerland, and then back at UCLA, Heck took a position with the Hercules Corporation in Wilmington, Delaware in 1957. After productive research work at Hercules, he was hired by the University of Delaware's Department of Chemistry and Biochemistry in 1971. Heck was a professor of chemistry at the University of Delaware. In 2012, he was appointed by De La Salle University in Manila as adjunct professor in its chemistry department. 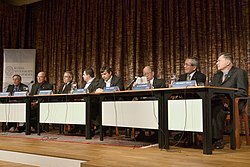 Peter Diamond, Dale T. Mortensen, Christopher A. Pissarides, Konstantin Novoselov, Andre Geim, Akira Suzuki, Ei-ichi Negishi, and Richard Heck, Nobel Prize Laureates 2010, at a press conference at the Royal Swedish Academy of Sciences in Stockholm. The development of the Heck reaction began with Heck's investigations of the coupling of arylmercury compounds with olefins using palladium as a catalyst during the late 1960s. This work was published in a series of seven consecutive articles in the Journal of the American Chemical Society (JACS) for which Heck was the sole author. During the early 1970s, Mizoroki independently reported the use of the less toxic aryl halides as the coupling partner in the reaction. During his career, Heck continued to improve the transformation, developing it into a powerful synthetic method for organic synthesis. The importance of this reaction grew slowly in the organic synthesis community. In 1982, Heck was able to write an Organic Reactions chapter that covered all the known instances in just 45 pages. By 2002, applications had grown to the extent that the Organic Reactions chapter published that year, limited to intramolecular Heck reactions, covered 377 pages. These reactions, a small part of the total, couple two parts of the same molecule. Today, the Heck reaction stands as one of the widely used methods for the creation of carbon-carbon bonds in the synthesis of organic chemicals. This reaction has been subject to numerous scientific review articles, including a ~600 page monograph dedicated to this subject published in 2009. Heck's work set the stage for a variety of other palladium-catalyzed coupling reactions, including those of aryl halides with derivatives of boronic acid (Suzuki–Miyaura coupling), organotin reagents (Stille coupling), organomagnesium compounds (Kumada-Corriu coupling), silanes (Hiyama coupling), and organozincs (Negishi coupling), as well as with amines (Buchwald–Hartwig amination) and alcohols. These palladium-catalyzed coupling reactions are now widely practiced in organic synthesis, including in the chemical engineering production of certain organic compounds in factories. Of the several reactions developed by Heck, the greatest societal impact has been from the palladium-catalyzed coupling of an alkyne with an aryl halide. This is the reaction that was used to couple fluorescent dyes to DNA bases, allowing the automation of DNA sequencing and the examination of the human genome. In Sonogashira's original report of what is now known as the Sonogashira coupling, his group modified an alkyne coupling procedure previously reported by Heck, by adding a copper(I) salt. Heck's contributions are not limited to the activation of halides by the oxidative addition of palladium. Heck was the first to fully characterize a π-allyl metal complex, and the first to elucidate the mechanism of alkene hydroformylation. Heck retired from the University of Delaware in 1989, where he became the Willis F. Harrington Professor Emeritus in the Department of Chemistry and Biochemistry. Its annual lectureship was named in his honor in 2004. In 2005, he was awarded the Wallace H. Carothers Award, which recognizes creative applications of chemistry that have had substantial commercial impact. He was awarded the 2006 Herbert C. Brown Award for Creative Research in Synthetic Methods. On 6 October 2010, the Swedish Royal Academy of Sciences awarded Heck the Nobel Prize in Chemistry. He shared the 2010 Nobel Prize with Ei-ichi Negishi and Akira Suzuki "for palladium-catalyzed cross couplings in organic synthesis." In 2011, Heck was awarded the Glenn T. Seaborg Medal for his work on palladium-catalyzed cross couplings. Heck moved to the Philippines after retirement  in 1989 with his wife, Socorro Nardo-Heck. The couple had no children. Heck died on October 9, 2015 in Manila in a public hospital. His wife predeceased him by 2 years. Heck received honorary doctorates from Uppsala University (Pharmacy) and De La Salle University (Science). ^ Suarez, Larissa Mae. "US scientist residing in Philippines wins 2010 chemistry Nobel". GMANews.tv. ^ Quismundo, Tarra. "He's the only Nobel winner living in RP". Inquirer.net. Archived from the original on 2010-10-10. ^ "Press release 6 October 2010". Royal Swedish Academy of Sciences. Retrieved 6 October 2010. ^ Finucane, Martin (October 6, 2010). "Nobel Prize winner is Springfield native". Boston Globe. ^ Richard F. Heck (1968). "Acylation, Methylation, and Carboxyalkylation of Olefins by Group VIII Metal Derivatives". Journal of the American Chemical Society. 90 (20): 5518–5526. doi:10.1021/ja01022a034. ^ Richard F. Heck (1968). "The arylation of allylic alcohols with organopalladium compounds. A new synthesis of 3-aryl aldehydes and ketones". J. Am. Chem. Soc. 90 (20): 5526–5531. doi:10.1021/ja01022a035. ^ Richard F. Heck (1968). "Allylation of aromatic compounds with organopalladium salts". J. Am. Chem. Soc. 90 (20): 5531–5534. doi:10.1021/ja01022a036. ^ Richard F. Heck (1968). "The palladium-catalyzed arylation of enol esters, ethers, and halides. A new synthesis of 2-aryl aldehydes and ketones". J. Am. Chem. Soc. 90 (20): 5535–5538. doi:10.1021/ja01022a037. ^ Richard F. Heck (1968). "Aromatic haloethylation with palladium and copper halides". J. Am. Chem. Soc. 90 (20): 5538–5542. doi:10.1021/ja01022a038. ^ Richard F. Heck (1968). "The addition of alkyl- and arylpalladium chlorides to conjugated dienes". J. Am. Chem. Soc. 90 (20): 5542–5546. doi:10.1021/ja01022a039. ^ Richard F. Heck (1968). "A synthesis of diaryl ketones from arylmercuric salts". J. Am. Chem. Soc. 90 (20): 5546–5548. doi:10.1021/ja01022a040. ^ Mizoroki, Tsutomu; Mori, Kunio; Ozaki, Atzumu (1971). "Arylation of Olefin with Aryl Iodine Catalyzed by Palladium". Bull. Chem. Soc. Jpn. 44 (2): 581. doi:10.1246/bcsj.44.581. Archived from the original (PDF) on 28 May 2011. ^ Heck, R. F.; Nolley, Jr., J. P. (1972). "Palladium-catalyzed Vinylic Hydrogen Substitution Reactions with Aryl, Benzyl, and Styryl Halides". J. Org. Chem. 37 (14): 2320–2322. doi:10.1021/jo00979a024. Quality of archived page is low. Full text access requires an account. ^ Richard F. Heck (1982). Palladium-Catalyzed Vinylation of Organic Halides. Organic Reactions. 27. pp. 345–390. doi:10.1002/0471264180.or027.02. ISBN 978-0-471-26418-7. Quality of archived page is low. Full text access requires an account. ^ Link, J. T. (2002). "Organic Reactions". Organic Reactions. 60. doi:10.1002/0471264180.or060.02. ISBN 0-471-26418-0. Quality of archived page is low. Full text access requires an account. ^ a b Heck, Richard F.; Breslow, David S. (1960). "ALLYLCOBALT CARBONYLS". J. Am. Chem. Soc. 82 (3): 750–751. doi:10.1021/ja01488a067. First page available free; full text requires purchase. Partial success in archiving. ^ "2006 ACS National Award Winners". C&EN. 84 (6): 34–38. 2006-02-06. Archived from the original on 2011-05-28. .
^ "BBC News – Molecule building work wins Nobel". bbc.co.uk. October 6, 2010. Archived from the original on October 7, 2010. Retrieved October 6, 2010. ^ "Richard F. Heck – Interview". Nobelprize.org. 7 October 2010. Archived from the original on 14 October 2010. Retrieved 7 October 2010. ^ Nicholas St. Fleur (October 15, 2015). "Richard F. Heck, Chemist Who Revolutionized Drug Development, Dies at 84". New York Times. Retrieved 2015-10-16. ^ Francisco, Rosemarie (2015-10-10). "Nobel laureate chemist Richard Heck, 84, dies in Manila". Reuters. Retrieved 2015-10-10. ^ "Honorary Doctors of the Faculty of Pharmacy". uu.se. Retrieved 28 May 2018. ^ "Make Life Simple" Through Chemistry, Nobel Laureate Dr. Richard Heck's Goal"". nast.ph. Retrieved 28 May 2018. Negishi, E. (1999). "A profile of Professor Richard F. Heck Discovery of the Heck reaction". Journal of Organometallic Chemistry. 576 (1–2): xv–xvi. doi:10.1016/S0022-328X(98)01136-X. Wikimedia Commons has media related to Richard Fred Heck. This page was last edited on 20 February 2019, at 21:54 (UTC).